Charles Powell’s family history is interwoven into the history of Southwest Florida. “Our roots and our lineage in this particular area is very deep,” Powell said. His family roots date back to when Fort Myers was a cattle town. His aunt and uncle once owned key pieces of property all over downtown. But it is one of those properties that unexpectedly flung him into the spotlight. When the city filed a lawsuit. 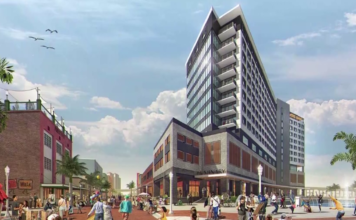 It came after the City of Fort Myers hit an impediment with its Luminary Hotel project, which was being built on land once owned by his aunt and uncle. The problem they encountered was a deed restriction that said the property could never be used for commercial purposes. He said nobody from the city approached his family or the other families that deeded the land back in the 1930’s, at the beginning of the hotel project. Even though, the former mayor admitted to council city leaders he knew of the deed restriction prior to them starting to bid the job to developers. But when mainsail development needed a loan to get the job done, Fifth Third Bank did see it as an impediment. It would not lend money for a project on land with that kind of restriction. In May, the city sued Powell and other descendants to clear the deed. “It wasn’t a very good way of doing business,” Powell said. And a cost to taxpayers, too. By July, the city had already spent more than $120,000 on legal fees. However, despite the incompetence, a judge ruled on Wednesday to clear the deed restrictions on a piece of the property where a new hotel is being built. The City of Fort Myers agreed to develop Lofton Island in the Caloosahatchee into a public park in exchange for clearance on the Edwards Drive property. “The whole procedure in a nutshell probably could have been avoided had their been some communications up front,” Powell said.